Winder, M., Andersson, H., Bauer, B., Bonsdorff, E., Björklung, C., Costalago, D., Gogina, M., Gröger, M., Herkül, K., Kock Rasmussen, E., Kotta, J., Lauringson, V., Lundström, K., MacKenzie, B. R., Margonski, P., Möller, T., Nyström, K., Ojaveer, H., Orav-Kotta, H., Puntila, R., Pärnoja, M., Skov, H., Tomczak, M. T., Törnroos, A., Warzocha, J., Wahlström, I., Zaiko, A. and Zettler, M. L. (2017) Projection of impacts of changed drivers on future biodiversity. . BIO-C3 Deliverable, D4.3 . EU Bonusproject BIO-C3, 16 + App. pp. DOI 10.3289/BIO-C3_D4.3. This list was generated on Sun Apr 21 19:48:25 2019 CEST. Stiasny, M. H. , Sswat, M. , Mittermayer, F. H. , Falk-Petersen, I. B., Schnell, N. K., Puvanendran, V., Mortensen, A., Reusch, T. B. H. and Clemmesen, C. (2019) Divergent responses of Atlantic cod to ocean acidification and food limitation. Global Change Biology, 25 (3). pp. 839-849. DOI 10.1111/gcb.14554. Stiasny, M. H. , Mittermayer, F. , Göttler, G., Bridges, C. R., Falk-Petersen, I. B., Puvanendran, V., Mortensen, A., Reusch, T. B. H. and Clemmesen, C. (2018) Effects of parental acclimation and energy limitation in response to high CO2 exposure in Atlantic cod. Scientific Reports, 8 . Art.Nr. 8348. DOI 10.1038/s41598-018-26711-y. Reusch, T. B. H. , Dierking, J. , Andersson, H. C., Bonsdorff, E., Carstensen, J., Casini, M., Czajkowski, M., Hasler, B., Hinsby, K., Hyytiäinen, K., Johannesson, K., Jomaa, S., Jormalainen, V., Kuosa, H., Kurland, S., Laikre, L., MacKenzie, B. R., Margonski, P., Melzner, F., Oesterwind, D., Ojaveer, H., Refsgaard, J. C., Sandström, A., Schwarz, G., Tonderski, K., Winder, M. and Zandersen, M. (2018) The Baltic Sea as a time machine for the future coastal ocean. Science Advances, 4 (5). eaar8195. DOI 10.1126/sciadv.aar8195. Moll, D., Kotterba, P., von Nordheim, L. and Polte, P. (2018) Storm-Induced Atlantic Herring (Clupea harengus) Egg Mortality in Baltic Sea Inshore Spawning Areas. Estuaries and Coasts, 41 (1). pp. 1-12. DOI 10.1007/s12237-017-0259-5. Florin, A. B., Hüssy, K., Blass, M., Oesterwind, D., Puntila, R., Ustups, D., Albrecht, C., Heimbrand, Y., Knospina, E., Koszarowski, K. and Odelström, A. (2017) How old are you-Evaluation of age reading methods for the invasive round goby (Neogobius melanostomus , Pallas 1814). Journal of Applied Ichthyology . DOI 10.1111/jai.13596. Kotterba, P., Moll, D., von Nordheim, L., Peck, M. A., Oesterwind, D. and Polte, P. (2017) Predation on larval Atlantic herring (Clupea harengus) in inshore waters of the Baltic Sea. Estuarine, Coastal and Shelf Science, 198 . pp. 1-11. DOI 10.1016/j.ecss.2017.08.017. Jänes, H., Herkül, K. and Kotta, J. (2017) Environmental niche separation between native and non-native benthic invertebrate species: Case study of the northern Baltic Sea. Marine Environmental Research, 131 . pp. 123-133. DOI 10.1016/j.marenvres.2017.08.001. Ojaveer, H., Gross, R., Laur, K., Arula, T. and Klais, R. (2017) Genetic analysis reveals the diversity of larval Gobiidae in a temperate estuary. Journal of Fish Biology, 91 (4). pp. 1048-1061. DOI 10.1111/jfb.13407. Kuprijanov, I., Herkül, K. and Kotta, J. (2017) Ecological niche differentiation between native and non-native shrimps in the northern Baltic Sea. Aquatic Ecology, 51 (3). pp. 389-404. DOI 10.1007/s10452-017-9624-5. von Nordheim, L., Kotterba, P., Moll, D. and Polte, P. (2017) Impact of Spawning Substrate Complexity on Egg Survival of Atlantic Herring (Clupea harengus, L.) in the Baltic Sea. Estuaries and Coasts . DOI 10.1007/s12237-017-0283-5. Lokko, K., Virro, T. and Kotta, J. (2017) Seasonal variability in the structure and functional diversity of psammic rotifer communities: role of environmental parameters. Hydrobiologia, 796 (1). pp. 287-307. DOI 10.1007/s10750-016-2923-3. Hummel, H., Van Avesaath, P., Wijnhoven, S., Kleine-Schaars, L., Degraer, S., Kerckhof, F., Bojanic, N., Skejic, S., Vidjak, O., Rousou, M., Orav-Kotta, H., Kotta, J., Jourde, J., Pedrotti, M. L., Leclerc, J. C., Simon, N., Rigaut-Jalabert, F., Bachelet, G., Lavesque, N., Arvanitidis, C., Pavloudi, C., Faulwetter, S., Crowe, T., Coughlan, J., Benedetti-Cecchi, L., Dal Bello, M., Magni, P., Como, S., Coppa, S., Ikauniece, A., Ruginis, T., Jankowska, E., Weslawski, J. M., Warzocha, J., Gromisz, S., Witalis, B., Silva, T., Ribeiro, P., Fernandes De Matos, V. K., Sousa-Pinto, I., Veiga, P., Troncoso, J., Guinda, X., Juanes De La Pena, J. A., Puente, A., Espinosa, F., Pérez-Ruzafa, A., Frost, M., Mcneill, C. L., Peleg, O. and Rilov, G. (2017) Geographic patterns of biodiversity in European coastal marine benthos. Journal of The Marine Biological Association of The United Kingdom, 97 (3). pp. 507-523. DOI 10.1017/S0025315416001119. Ojaveer, H., Lankov, A., Teder, M., Simm, M. and Klais, R. (2017) Feeding patterns of dominating small pelagic fish in the Gulf of Riga, Baltic Sea. Hydrobiologia, 792 (1). pp. 331-344. DOI 10.1007/s10750-016-3071-5. Stuckas, H., Knöbel, L., Schade, H., Breusing, C., Hinrichsen, H. H., Bartel, M., Langguth, K. and Melzner, F. (2017) Combining hydrodynamic modelling with genetics: can passive larval drift shape the genetic structure of Baltic Mytilus populations?. Molecular Ecology, 26 (10). pp. 2765-2782. DOI 10.1111/mec.14075. Jänes, H., Kotta, J., Pärnoja, M., Crowe, T. P., Rindi, F., Orav-Kotta, H. and Carrington, E. (2017) Functional traits of marine macrophytes predict primary production. Functional Ecology, 31 (4). pp. 975-986. DOI 10.1111/1365-2435.12798. Klais, R., Otto, S. A., Teder, M., Simm, M. and Ojaveer, H. (2017) Winter–spring climate effects on small-sized copepods in the coastal Baltic Sea. ICES Journal of Marine Science, 74 (7). pp. 1855-1864. DOI 10.1093/icesjms/fsx036. Oesterwind, D., Bock, C., Förster, A., Gabel, M., Henseler, C., Kotterba, P., Menge, M., Myts, D. and Winkler, H. M. (2017) Predator and prey: the role of the round goby Neogobius melanostomus in the western Baltic. Marine Biology Research . pp. 1-10. DOI 10.1080/17451000.2016.1241412. Griffiths, J. R., Kadin, M., Nascimento, F. J. A., Tamelander, T., Törnroos, A., Bonaglia, S., Bonsdorff, E., Brüchert, V., Gardmark, A., Järnström, M., Kotta, J., Lindegren, M., Nordström, M. C., Norkko, A., Olsson, J., Weigel, B., Zydelis, R., Blenckner, T., Niiranen, S. and Winder, M. (2017) The importance of benthic-pelagic coupling for marine ecosystem functioning in a changing world. Global Change Biology, 23 (6). pp. 2179-2196. DOI 10.1111/gcb.13642. Kotterba, P., Moll, D., Hammer, C., Peck, M. A., Oesterwind, D. and Polte, P. (2017) Predation on Atlantic herring (Clupea harengus ) eggs by the resident predator community in coastal transitional waters. Limnology and Oceanography, 62 (6). pp. 2616-2628. DOI 10.1002/lno.10594. Neumann, V., Schaber, M., Eero, M., Böttcher, U. and Köster, F. W. (2017) Quantifying predation on Baltic cod early life stages. Canadian Journal of Fisheries and Aquatic Sciences, 74 (6). pp. 833-842. DOI 10.1139/cjfas-2016-0215. Nurske, K., Kotta, J., Rätsep, M., Kotta, I. and Kreitsberg, R. (In Press / Accepted) Experimental evaluation of the effects of the novel predators, round goby and mud crab on benthic invertebrates in the Gulf of Riga, the Baltic Sea. Journal of The Marine Biological Association of The United Kingdom . Peterson, A. and Herkül, K. (2017) Mapping benthic biodiversity using georeferenced environmental data and predictive modeling. Marine Biodiversity . DOI 10.1007/s12526-017-0765-5. Polte, P., Kotterba, P., Moll, D. and von Nordheim, L. (2017) Ontogenetic loops in habitat use highlight the importance of littoral habitats for early life-stages of oceanic fishes in temperate waters. Scientific Reports, 7 . p. 42709. DOI 10.1038/srep42709. Rossberg, A. G., Uusitalo, L., Berg, T., Zaiko, A., Chenuil, A., Uyarra, M. C., Borja, A. and Lynam, C. P. (2017) Quantitative criteria for choosing targets and indicators for sustainable use of ecosystems. Ecological Indicators, 72 . pp. 215-224. DOI 10.1016/j.ecolind.2016.08.005. Probst, W. N., Rau, A. and Oesterwind, D. (2016) A proposal for restructuring Descriptor 3 of the Marine Strategy Framework Directive (MSFD). Marine Policy, 74 . pp. 128-135. DOI 10.1016/j.marpol.2016.09.026. Lehtinen, S., Suikkanen, S., Hällfors, H., Kauppila, P., Lehtiniemi, M., Tuimala, J., Uusitalo, L. and Kuosa, H. (2016) Approach for Supporting Food Web Assessments with Multi-Decadal Phytoplankton Community Analyses—Case Baltic Sea. Frontiers in Marine Science, 3 . Art. No. 220. DOI 10.3389/fmars.2016.00220. Olenin, S., Narščius, A., Gollasch, S., Lehtiniemi, M., Marchini, A., Minchin, D. and Srėbalienė, G. (2016) New Arrivals: An Indicator for Non-indigenous Species Introductions at Different Geographical Scales. Frontiers in Marine Science, 3 . Art. No. 208. DOI 10.3389/fmars.2016.00208. Weigel, B., Blenckner, T. and Bonsdorff, E. (2016) Maintained functional diversity in benthic communities in spite of diverging functional identities. Oikos, 125 (10). pp. 1421-1433. DOI 10.1111/oik.02894. Stiasny, M. , Mittermayer, F. , Sswat, M. , Voss, R., Jutfelt, F., Chierici, M., Puvanendran, V., Mortensen, A., Reusch, T. B. H. and Clemmesen, C. (2016) Ocean Acidification Effects on Atlantic Cod Larval Survival and Recruitment to the Fished Population. PLoS ONE, 11 (8). e0155448. DOI 10.1371/journal.pone.0155448. Eero, M., Andersson, H. C., Almroth-Rosell, E. and MacKenzie, B. R. (2016) Has eutrophication promoted forage fish production in the Baltic Sea?. Ambio . DOI 10.1007/s13280-016-0788-3. Chusevė, R., Nygard, H., Vaiciūtė, D., Daunys, D. and Zaiko, A. (2016) Application of signal detection theory approach for setting thresholds in benthic quality assessments. Ecological Indicators, 60 . pp. 420-427. DOI 10.1016/j.ecolind.2015.07.018. Andersen, K. H., Jacobsen, N. S., Jansen, T. and Beyer, J. E. (2016) When in life does density dependence occur in fish populations?. Fish and Fisheries, 18 (4). pp. 656-667. DOI 10.1111/faf.12195. Grinienė, E., Šulčius, S. and Kuosa, H. (2016) Size-selective microzooplankton grazing on the phytoplankton in the Curonian Lagoon (SE Baltic Sea). Oceanologia, 58 (4). pp. 292-301. DOI 10.1016/j.oceano.2016.05.002. Herkül, K., Lauringson, V. and Kotta, J. (2016) Specialization among amphipods: the invasiveGammarus tigrinushas narrower niche space compared to native gammarids. Ecosphere, 7 (6). e01306. DOI 10.1002/ecs2.1306. Jacobsen, N. S., Burgess, M. G. and Andersen, K. H. (2016) Efficiency of fisheries is increasing at the ecosystem level. Fish and Fisheries, 18 (2). pp. 199-211. DOI 10.1111/faf.12171. Kari, E., Kratzer, S., Beltrán-Abaunza, J. M., Harvey, E. T. and Vaičiūtė, D. (2016) Retrieval of suspended particulate matter from turbidity – model development, validation, and application to MERIS data over the Baltic Sea. International Journal of Remote Sensing . pp. 1-21. DOI 10.1080/01431161.2016.1230289. Kotta, J., Nurkse, K., Puntila, R. and Ojaveer, H. (2016) Shipping and natural environmental conditions determine the distribution of the invasive non-indigenous round goby Neogobius melanostomus in a regional sea. Estuarine, Coastal and Shelf Science, 169 . pp. 15-24. DOI 10.1016/j.ecss.2015.11.029. Lauringson, V. and Kotta, J. (2016) Mussels of a marginal population affect the patterns of ambient macrofauna: A case study from the Baltic Sea. Marine Environmental Research, 116 . pp. 10-17. DOI 10.1016/j.marenvres.2016.02.010. Lennuk, L., Kotta, J., Lauringson, V., Taits, K. and Jänes, H. (2016) Which environmental scales and factors matter for mesozooplankton communities in a shallow brackish water ecosystem?. Journal of Plankton Research, 38 (1). pp. 139-153. DOI 10.1093/plankt/fbv111. Nurkse, K., Kotta, J., Orav-Kotta, H. and Ojaveer, H. (2016) A successful non-native predator, round goby, in the Baltic Sea: generalist feeding strategy, diverse diet and high prey consumption. Hydrobiologia, 777 (1). pp. 271-281. DOI 10.1007/s10750-016-2795-6. Oesterwind, D., Rau, A. and Zaiko, A. (2016) Drivers and pressures – Untangling the terms commonly used in marine science and policy. Journal of Environmental Management, 181 . pp. 8-15. DOI 10.1016/j.jenvman.2016.05.058. Palsson, A., Bekkevold, D., Gross, R., Arula, T., Helyar, S. J. and Ojaveer, H. (2016) Outlier Loci Detect Intraspecific Biodiversity amongst Spring and Autumn Spawning Herring across Local Scales. PLoS ONE, 11 (4). e0148499. DOI 10.1371/journal.pone.0148499. Reisalu, G., Kotta, J., Herkül, K. and Kotta, I. (2016) The invasive amphipod Gammarus tigrinus Sexton, 1939 displaces native gammarid amphipods from sheltered macrophyte habitats of the Gulf of Riga. Aquatic Invasions, 11 (1). pp. 45-54. DOI 10.3391/ai.2016.11.1.05. Smoliński, S. and Radtke, K. (2016) Spatial prediction of demersal fish diversity in the Baltic Sea: comparison of machine learning and regression-based techniques. ICES Journal of Marine Science . fsw136. DOI 10.1093/icesjms/fsw136. Teixeira, H., Berg, T., Uusitalo, L., Fürhaupter, K., Heiskanen, A. S., Mazik, K., Lynam, C. P., Neville, S., Rodriguez, J. G., Papadopoulou, N., Moncheva, S., Churilova, T., Kryvenko, O., Krause-Jensen, D., Zaiko, A., Veríssimo, H., Pantazi, M., Carvalho, S., Patrício, J., Uyarra, M. C. and Borja, À. (2016) A Catalogue of Marine Biodiversity Indicators. Frontiers in Marine Science, 3 (Art. Nr. 207). DOI 10.3389/fmars.2016.00207. Ardura, A., Zaiko, A., Martinez, J. L., Samulioviene, A., Semenova, A. and Garcia-Vazquez, E. (2015) eDNA and specific primers for early detection of invasive species – A case study on the bivalve Rangia cuneata, currently spreading in Europe. Marine Environmental Research, 112(B) . pp. 48-55. DOI 10.1016/j.marenvres.2015.09.013. Hordoir, R., Axell, L., Löptien, U. , Dietze, H. and Kuznetsov, I. (2015) Influence of sea level rise on the dynamics of salt inflows in the Baltic Sea. Journal of Geophysical Research: Oceans, 120 (10). pp. 6653-6668. DOI 10.1002/2014JC010642. Ojaveer, H., Tomkiewicz, J., Arula, T. and Klais, R. (2015) Female ovarian abnormalities and reproductive failure of autumn-spawning herring (Clupea harengus membras) in the Baltic Sea. ICES Journal of Marine Science, 72 (8). pp. 2332-2340. DOI 10.1093/icesjms/fsv103. Kotta, J., Oganjan, K., Lauringson, V., Pärnoja, M., Kaasik, A., Rohtla, L., Kotta, I. and Orav-Kotta, H. (2015) Establishing functional relationships between abiotic environment, macrophyte coverage, resource gradients and the distribution of Mytilus trossulus in a brackish non-tidal environment. PLoS ONE, 10 (8). e0136949. DOI 10.1371/journal.pone.0136949. Eero, M., Hjelm, J., Behrens, J., Buchmann, K., Cardinale, M., Casini, M., Gasyukov, P., Holmgren, N., Horbowy, J., Hüssy, K., Kirkegaard, E., Kornilovs, G., Krumme, U., Köster, F. W., Oeberst, R., Plikshs, M., Radtke, K., Raid, T., Schmidt, J., Tomczak, M. T., Vinther, M., Zimmermann, C. and Storr-Paulsen, M. (2015) Food for Thought : Eastern Baltic cod in distress: biological changes and challenges for stock assessment. ICES Journal of Marine Science . DOI 10.1093/icesjms/fsv109. Ojaveer, H. and Kotta, J. (2015) Ecosystem impacts of the widespread non-indigenous species in the Baltic Sea: literature survey evidences major limitations in knowledge. Hydrobiologia, 750 (1). pp. 171-185. DOI 10.1007/s10750-014-2080-5. Zaiko, A. and Daunys, D. (2015) Invasive ecosystem engineers and biotic indices: Giving a wrong impression of water quality improvement?. Ecological Indicators, 52 . pp. 292-299. DOI 10.1016/j.ecolind.2014.12.023. Törnroos, A., Bonsdorff, E., Bremner, J., Blomqvist, M., Josefson, A. B., Garcia, C. and Warzocha, J. (2015) Marine benthic ecological functioning over decreasing taxonomic richness. Journal of Sea Research, 98 . pp. 49-56. DOI 10.1016/j.seares.2014.04.010. Almroth-Rosell, E., Eilola, K., Kuznetsov, I., Hall, P. O. J. and Meier, H. E. M. (2015) A new approach to model oxygen dependent benthic phosphate fluxes in the Baltic Sea. Journal of Marine Systems, 144 . pp. 127-141. DOI 10.1016/j.jmarsys.2014.11.007. Kotta, J., Kotta, I., Bick, A., Bastrop, R. and Väinölä, R. (2015) Modelling habitat range and seasonality of a new, non-indigenous polychaete Laonome sp. (Sabellida, Sabellidae) in Pärnu Bay, the north-eastern Baltic Sea. Aquatic Invasions, 10 (3). pp. 275-285. DOI 10.3391/ai.2015.10.3.03. Golz, A. L., Burian, A. and Winder, M. (2015) Stoichiometric regulation in micro- and mesozooplankton. Journal of Plankton Research . DOI 10.1093/plankt/fbu109. Aarnio, K., Törnroos, A., Björklund, C. and Bonsdorff, E. (2015) Food web positioning of a recent coloniser: the North American Harris mud crab Rhithropanopeus harrisii (Gould, 1841) in the northern Baltic Sea. Aquatic Invasions, 10 (4). pp. 399-413. DOI 10.3391/ai.2015.10.4.04. Arula, T., Laur, K., Simm, M. and Ojaveer, H. (2015) Dual impact of temperature on growth and mortality of marine fish larvae in a shallow estuarine habitat. Estuarine, Coastal and Shelf Science, 167 . pp. 326-335. DOI 10.1016/j.ecss.2015.10.004. Arula, T., Raid, T., Simm, M. and Ojaveer, H. (2015) Temperature-driven changes in early life-history stages influence the Gulf of Riga spring spawning herring (Clupea harengus m.) recruitment abundance. Hydrobiologia . DOI 10.1007/s10750-015-2486-8. Eero, M., Hjelm, J., Behrens, J., Buchmann, K., Cardinale, M., Casini, M., Gasyukov, P., Holmgren, N., Horbowy, J., Hüssy, K., Kirkegaard, E., Kornilovs, G., Krumme, U., Köster, F. W., Oeberst, R., Plikshs, M., Radtke, K., Raid, T., Schmidt, J., Tomczak, M. T., Vinther, M., Zimmermann, C. and Storr-Paulsen, M. (2015) Eastern Baltic cod in distress: biological changes and challenges for stock assessment. ICES Journal of Marine Science: Journal du Conseil, 72 (8). pp. 2180-2186. DOI 10.1093/icesjms/fsv109. 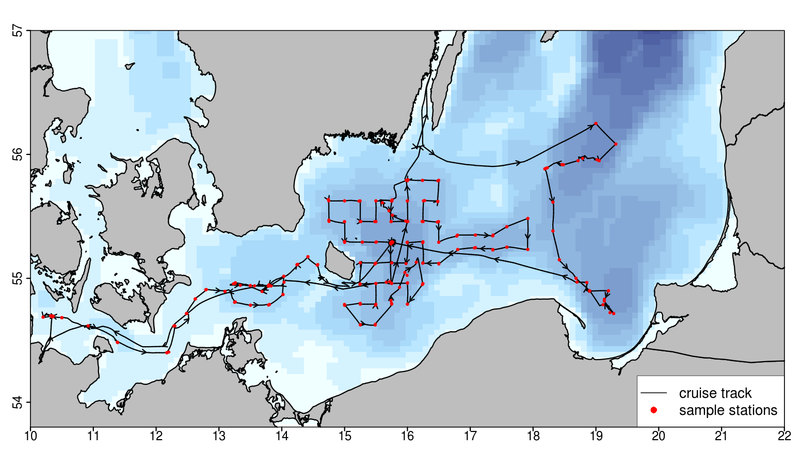 Jonsson, P. R., Nilsson Jacobi, M., Moksnes, P. O. and Beaumont, L. (2015) How to select networks of marine protected areas for multiple species with different dispersal strategies. Diversity and Distributions, 22 (2). pp. 161-173. DOI 10.1111/ddi.12394. Kuprijanov, I., Kotta, J., Lauringson, V. and Herkül, K. (2015) Trophic interactions between native and alien palaemonid prawns and an alien gammarid in a brackish water ecosystem. Proceedings of the Estonian Academy of Sciences, 64 (4). pp. 518-524. DOI 10.3176/proc.2015.4.06. Lehtiniemi, M. (2015) EU:n vieraslajiasetus tuli voimaan. Ympäristö, 2015 (1). pp. 18-21. Lehtiniemi, M., Ojaveer, H., David, M., Galil, B., Gollasch, S., McKenzie, C., Minchin, D., Occhipinti-Ambrogi, A., Olenin, S. and Pederson, J. (2015) Dose of truth - Monitoring marine non-indigenous species to serve legislative requirements. Marine Policy, 54 . pp. 26-35. DOI 10.1016/j.marpol.2014.12.015. Liversage, K. and Kotta, J. (2015) Disturbance-related patterns in unstable rocky benthic habitats of the north-eastern Baltic coast. Proceedings of the Estonian Academy of Sciences, 64 (1). p. 53. DOI 10.3176/proc.2015.1.07. Lokko, K., Kotta, J., Orav-Kotta, H., Nurkse, K. and Pärnoja, M. (2015) Introduction of a functionally novel consumer to a low diversity system: Effects of the mud crab Rhithropanopeus harrisii on meiobenthos. Estuarine, Coastal and Shelf Science . DOI 10.1016/j.ecss.2015.11.017. Nurkse, K., Kotta, J., Orav-Kotta, H., Pärnoja, M. and Kuprijanov, I. (2015) Laboratory analysis of the habitat occupancy of the crab Rhithropanopeus harrisii (Gould) in an invaded ecosystem: The north-eastern Baltic Sea. Estuarine, Coastal and Shelf Science, 154 . pp. 152-157. DOI 10.1016/j.ecss.2014.12.046. Ojaveer, H., Galil, B. S., Lehtiniemi, M., Christoffersen, M., Clink, S., Florin, A. B., Gruszka, P., Puntila, R. and Behrens, J. W. (2015) Twenty five years of invasion: management of the round goby Neogobius melanostomus in the Baltic Sea. Management of Biological Invasions, 6 (4). pp. 329-339. DOI 10.3391/mbi.2015.6.4.02. Skabeikis, A. and Lesutiene, J. (2015) Feeding activity and diet composition of round goby (Neogobius melanostomus) in the coastal waters of SE Baltic Sea. Oceanological and Hydrobiological Studies, 44 (4). pp. 508-519. DOI 10.1515/ohs-2015-0048. Törnroos, A., Nordström, M. C., Aarnio, K. and Bonsdorff, E. (2015) Environmental context and trophic trait plasticity in a key species, the tellinid clam Macoma balthica L.. Journal of Experimental Marine Biology and Ecology, 472 . pp. 32-40. DOI 10.1016/j.jembe.2015.06.015. Zaiko, A., Samuiloviene, A., Ardura, A. and Garcia-Vazquez, E. (2015) Metabarcoding approach for nonindigenous species surveillance in marine coastal waters. Marine Pollution Bulletin, 100 (1). pp. 53-59. DOI 10.1016/j.marpolbul.2015.09.030. Kalaus, M. and Ojaveer, H. (2014) Over one decade of invasion: the non-indigenous cladoceran Evadne anonyx G.O. Sars, 1897 in a low-salinity environment. Aquatic Invasions, 9 . Eilola, K., Almroth-Rosell, E. and Meier, H. E. M. (2014) Impact of saltwater inflows on phosphorus cycling and eutrophication in the Baltic Sea: a 3D model study. Tellus A: Dynamic meteorology and oceanography, 66 . p. 23985. DOI 10.3402/tellusa.v66.23985. Kotta, J., Möller, T., Orav-Kotta, H. and Pärnoja, M. (In Press / Accepted) Realized niche width of a brackish water submerged aquatic vegetation under current environmental conditions and projected influences of climate change. Marine Environmental Research . DOI 10.1016/j.marenvres.2014.05.002. Dierking, J. , Hüssy, K. and Laikre, L. (2015) Finding bridges between biodiversity research and ecosystem–based management. BONUS in Brief, 2015 (2). pp. 2-3. Petereit, C., Gill, D. and Puebla, O. (2015) Glasfische" der Ostsee - Was sind es wirklich?. Das Fischerblatt, 2015-1 . pp. 8-10. Storr-Paulsen, M. and Huwer, B. (2014) Havforskningsskibet DANA er netop vendt hjem fra Østersøen. Fiskeri Tidende . p. 9. Petereit, C. and Hoch, C. (2014) Die Bestandsgröße des Ostsee-Herbst-Herings ist unbekannt. Fisch & Fang, 2014 (11). p. 59. Samuilovienė, A., Šiaulys, A., Baronaite, U. and Zaiko, A. (2016) Genetic population structure and genetic connectivity of Lithuanian blue mussel Mytilus sp. populations assessed by microsatellite DNA variation = Genetine Midiju (Mytillus SPP.) Populiaciju Struktura ir Populiaciju Jungimosi analize Mirkrosatelitiniu DNR Žymenu Pagalba. [Paper] In: National conference on Marine and Coastal Research. , 27.-29.04.2016, Kalipeda, Lithuania . Proceedings of the National conference on Marine and Coastal Research. ; pp. 163-165 . Skabeikis, A., Morkune, R., Siaulys, A. and Lesutiene, J. (2016) What can we learn about changes in coastal food web structure after the round goby invasion?. [Paper] In: ICES Annual Science Conference 2016. , 19.-23.09.2016, Riga, Latvia . ICES Council Meeting Papers, C:109 . Skabeikis, A., Šiaulys, A. and Lesutiene, J. (2016) Feeding of the round goby (Neogobius melanostomus) in the hard bottom coastal habitats of the Baltic Sea. [Paper] In: National conference on Marine and Coastal Research. , 27.-29.04.2016, Kalipeda, Lithuania . Proceedings of the National conference on Marine and Coastal Research. ; pp. 171-174 . Dierking, J. , von Dewitz, B. , Elsbernd, L., Schulz, H., Bracamonte, S., Hüssy, K., Hemmer-Hansen, J., Krumme, U., Oeberst, R., Hinrichsen, H. H. and Reusch, T. B. (2015) Oxygen minimum zone induced rapid temporal fluctuations of Eastern Baltic cod genetic diversity. [Paper] In: ICES Annual Science Conference 2015. , 21.-25.09.2015, Copenhagen, Denmark . ICES Council Meeting Papers, 2015 (Q:22). Kotterba, P., Polte, P., Moll, D., von Nordheim, L., Hammer, H., Oesterwind, D. and Peck, M. A. (2017) Atlantic herring Clupea harengus within the coastal food web of shallow inshore waters. [Talk] In: ICES/PICES Symposium on Drivers of dynamics of small pelagic fish resources. , 06.-11.03.2017, Victoria, Canada . Oesterwind, D., Bock, C., Förster, A., Gabel, M., Henseler, C., Kotterba, P., Menge, M., Myts, D. and Winkler, H. (2017) Predator and prey; the role of Neogobius melanostomus in the western Baltic. [Talk] In: Round Goby Workshop. , 25.06.2017, Tallin, Estland . Oesterwind, D., Bock, C., Förster, A., Gabel, M., Henseler, C., Kotterba, P., Menge, M., Myts, D., Winkler, H. M. and Wiegleb, J. (2017) Food web studies and habitat selection of the invasive round goby (N. melanostomus) in the Western Baltic. [Talk] In: BONUS Symposium. , 18.10.2017, Tallin, Estland . Oesterwind, D., Rau, A. and Zaiko, A. (2017) Drivers and Pressures - Untangling the terms commonly used in marine science and policy. [Talk] In: BONUS Mini-Symposium. , 27.06.2017, Kiel, Germany . Peck, M. A., Clemmesen, C. , Hufnagl, M., Illing, B., Kotterba, P., Moyano, M., Paulsen, P. and Polte, P. (2017) Bottom-up and Top-down Processes Impacting Early Life Stages of Herring (Clupea harengus) in the Southwest Baltic: A Synthesis of Recent Laboratory, Field and Modelling Studies. [Talk] In: 41. Annual Larval Fish Conference. , 12.-16.07.2017, Austin, Texas, USA . Reusch, T. B. H. , Dierking, J. , Andersson, H., Bonsdorff, E., Carstensen, J., Casini, M., Czajkowski, M., Hasler, B., Hinsby, K., Hyytiäinen, K., Johannesson, K., Jomaa, S., Jormalainen, V., Kuosa, H., Laikre, L., MacKenzie, B., Margonski, P., Oesterwind, D., Ojaveer, H., Refsgaard, J. C., Sandström, A., Schwarz, G., Tonderski, K., Winder, M. and Zandersen, M. (2017) The Baltic Sea: a time machine for the future coastal ocean. [Talk] In: BONUS Symposium. , 18.-19.10.2017, Tallin, Estland . Bonsdorff, E. (2016) Functional aspects of benthic diversity in the Baltic Sea; responses to environmental change. [Invited talk] In: Seminar on Marine Biodiversity. , 03.10.2016, Department of Bioscience, Aarhus University, Denmark . Eero, M., Casini, M., Hüssy, K., Köster, F., MacKenzie, B. R., Neuenfeldt, S. and Tomkiewicz, J. (2016) Ecosystem indicators in the context of fisheries management: example of cod in the Baltic Sea. [Talk] In: 7. World Fisheries Congress. , 23.-27.05.2016, Busan, Korea . Köster, F., Huwer, B., Hinrichsen, H. H., Neumann, V., Makarchouk, A., Eero, M., von Dewitz, B. , Tomkiewicz, J., Hüssy, K. and Plikshs, M. (2016) Baltic cod recruitment – the impact of changing environmental conditions. [Talk] In: 7. World Fisheries Congress. , 23.-27.05.2016, Busan, Korea . Moll, D., Kotterba, P., von Nordheim, L. and Polte, P. (2016) Estimating the contribution of single nursery areas to the overall herring (Clupea harengus) population in the western Baltic Sea by otolith chemistry. [Talk] In: 51. European Marine Biology Symposium. , 26.-30.09.2016, Rhodos, Greece . Nurske, K., Kotta, J., Pärnoja, M. and Kotta, I. (2016) Separate and interactive effects of non-indigenous species on native communities: the two aggressive novel benthic predators in the Baltic Sea. [Talk] In: 51. European Marine Biology Symposium. , 26.-30.09.2016, Rhodos, Greece . Petereit, C., Franke, A., Dewitz, B., Kraus, G., Clemmesen, C. , Köster, F. W., Nyberg, S. and Hinrichsen, H. H. (2016) Egg buoyancy measurements of Baltic Sea fish – Method & Application. [Invited talk] In: Joint Seminar Series Institute of Hydrobiology and Fishery Science University of Hamburg and Thünen Institute for Sea Fisheries. , 08.07.2016, Hamburg, Germany . Siaulys, A. (2016) Marine protection in Lithuania. [Public Lecture] In: Open Lecture at Klaipeda University. , 15.11.2016, Klaipeda, Lithuania . von Nordheim, L., Kotterba, P., Moll, D. and Polte, P. (2016) Effects of benthic substrate complexity on egg mortality of Atlantic herring (Clupea harengus) in the Baltic Sea. [Talk] In: 51. European Marine Biology Symposium. , 26.-30.09.2016, Rhodos, Greece . Almroth-Rosell, E., Eero, M., Andersson, H. and MacKenzie, B. R. (2015) Eutrophication no major driver of forage fish production in the Baltic Sea. [Talk] In: The Swedish Society for Marine Sciences and Swedish Marine Science Conference (Havsforskningskonferens). , 18.-20.11.2015, Lund, Sweden . Almroth-Rosell, E., Eilola, K., Kuznetsov, I., Hall, P. O. J. and Meier, H. E. M. (2015) Modelling the oxygen dependent benthic phosphate fluxes in the Baltic Sea - A new approach. [Talk] In: ASLO Aquatic Sciences Meeting 2015. , 22.-27.02.2015, Granada, Spain . Arula, T., Ojaveer, H. and Raid, T. (2015) Mortality and growth at larval stage: advancing the understanding of stock dynamics processes in the Gulf of Riga spring spawning herring (Clupea harengus membras). [Talk] In: 10. Baltic Sea Science Congress. , 15.-19.06.2015, Riga, Latvia . Bekkevold, D., Gross, R., Arula, T. and Ojaveer, H. (2015) Spring and autumn spawning herring in the Gulf of Riga: intraspecific biodiversity across small local scales. [Talk] In: ICES Annual Science Conference 2015. , 21.-25.09.2015, Copenhagen, Denmark . Bonsdorff, E. (2015) The ecology of the coastal filter in the Baltic Sea – structure, function, and adaptation. [Talk] In: 275 year anniversary of the Royal Swedish Academy of Sciences. , 17.-18.02.2015, Göteburg, Sweden . Briski, E. (2015) Basic principles of invasion biology. [Invited talk] In: BONUS BIO-C3/Bambi/Inspire summer school. , 05.-11.07.2015, Glückstadt, Germany . Briski, E. (2015) Vectors of species introductions. [Invited talk] In: BONUS BIO-C3/Bambi/Inspire summer school. , 05.-11.07.2015, Glückstadt, Germany . Colin, S. P., MacPherson, R., Gemmel, B., Costello, J. H., Sutherland, K. and Jaspers, C. (2015) Elevating the predatory effect: sensory-scanning foraging strategy by the lobate ctenophore Mnemiopsis Leidyi. [Talk] In: ASLO Aquatic Sciences Meeting 2015. , 22.-27.02.2015, Granada, Spain . Dierking, J. , von Dewitz, B. , Elsbernd, L., Bracamonte, S., Schulz, H., Hüssy, K., Hinrichsen, H. H. and Reusch, T. B. H. (2015) Baltic cod genetic diversity in SD 25 predicted by stock structure and oxygen situation: A different perspective on the cod ageing problem?. [Talk] In: ICES Benchmark for the Baltic cod stocks (WKBALCOD). , 03.03.2015, Rostock, Germany . Dierking, J. , von Dewitz, B. , Hinrichsen, H. H. and Reusch, T. B. (2015) Oxygen minimum zone induced fluctuations in cod genetic diversity – and what the Baltic Sea may tell us about the global future ocean . [Talk] In: Sustainable Ocean Development Symposium. , 28.-30.09.2015, New York City, USA . Eero, M., Andersson, H., Almroth Rosell, E. and MacKenzie, B. R. (2015) Has human-induced eutrophication promoted fish production in the Baltic Sea?. [Talk] In: Oceans Past V. , 18.-20.05.2015, Tallinn, Estonia . Eero, M., Andersson, H., Almroth Rosell, E. and MacKenzie, B. R. (2015) Has human-induced eutrophication promoted fish production in the Baltic Sea?. [Talk] In: ICES Annual Science Conference 2015. , 21.-25.09.2015, Copenhagen, Denmark . Henseler, C., Bock, C., Kotterba, P., Winkler, H. and Oesterwind, D. (2015) Biology, abundance and feeding ecology of the round goby (Neogobius melanostomus) in the eastern German Baltic. [Talk] In: ICES Annual Science Conference 2015. , 21.-25.09.2015, Copenhagen, Denmark . Hüssy, K., Mosegaard, H., Albertsen, C. M., Hemmer-Hansen, J. and Eero, M. (2015) Stock mixing of eastern and western Baltic cod in SD 24: Baltic cod, stock discrimination, migration, otolith shape analysis. [Talk] In: ICES Annual Science Conference 2015. , 21.-25.09.2015, Copenhagen, Denmark . Jaspers, C. , Hinrichsen, H. H. and Möller, F. (2015) The invasive comb jelly Mnemiopsis Leidyi in northern Europe: transport, origin and local extinction and re-invasions of subpopulations. [Talk] In: ASLO Aquatic Sciences Meeting 2015. , 22.-27.02.2015, Granada, Spain . Jaspers, C. , Weiland-Bräuer, N. and Reusch, T. B. H. (2015) The role of hybridization and microbial associations for invasion success in a comb jelly. [Talk] In: Future Ocean: Cluster Retreat 2015. , 14.-15.10.2015, Neumünster, Germany . Klais, R., Lehtinieimi, M., Teder, M., Rubene, G., Semenova, A., Margonski, P., Ikauniece, A., Simm, M., Pollumäe, A., Griniene, E., Mäkinen, K. and Ojaveer, H. (2015) Spatiotemporal variability of the Baltic Sea mesozooplankton. [Talk] In: ICES Workshop on Spatial Analyses for the Baltic Sea (WKSPATIAL). , 03.-06.11.2015, Rome, Italy . Klais, R., Lehtiniemi, M., Teder, M., Rubene, G., Semenova, A., Margonski, P., Ikauniece, A., Simm, M., Pöllumäe, A. and Ojaveer, H. (2015) Spatial and temporal variability of mesozooplankton in the Baltic Sea. [Talk] In: ICES Annual Science Conference 2015. , 21.-25.09.2015, Copenhagen, Denmark . Kotterba, P. (2015) Atlantic herring Clupea harengus within the estuarine food web of southern Baltic lagoons. [Talk] In: Herring Recruitment workshop. , 2015, Rostock, Germany . Kotterba, P. (2015) Estuarine stickleback predation on the eggs of inshore-spawning Atlantic herring in the Baltic Sea. [Talk] In: 23. Biennial CERF Conference. , 08.-12.11.2015, Portland, Oregon, USA . Kotterba, P., Beyer, S., Heiler, J., Moll, D. and Polte, P. (2015) Habitat utilization of herring larvae in an inshore retention area in the Western Baltic Sea. [Talk] In: European Marine Biology Symposium 2015 (EMBS 50). , 21.-25.09.2015, Helgoland, Germany . Köster, F. W., Huwer, B., Hinrichsen, H. H., Neumann, V., Makarchouk, A., Eero, M., Hüssy, K. and Plikshs, M. (2015) Processes controlling recruitment in Baltic cod. [Talk] In: ICES Annual Science Conference 2015. , 21.-25.09.2015, Copenhagen, Denmark . Moll, D., Kotterba, P. and Polte, P. (2015) Otolith chemistry – An opportunity to estimate the importance of single spawning grounds to the overall population of the WBSSH. [Talk] In: Herring Recruitment workshop. , 2015, Rostock, Germany . Moll, D., Kotterba, P. and Polte, P. (2015) Spawning bed selection of Atlantic herring in coastal waters of the Western Baltic Sea. [Talk] In: European Marine Biology Symposium 2015 (EMBS 50). , 21.-25.09.2015, Helgoland, Germany . Moll, D., Kotterba, P., Nordheim, L. v. and Polte, P. (2015) Spawning bed selection of Atlantic herring in the waters of the Western Baltic Sea. [Talk] In: 39. Annual Larval Fish Conference. , 12.-16.07.2015, Wien, Austria . Moll, D., Kotterba, P., Nordheim, L. v. and Polte, P. (2015) Spawning bed selection of Atlantic herring in the waters of the Western Baltic Sea. [Talk] In: Herring Recruitment workshop. , 2015, Rostock, Germany . Nurkse, K. (2015) Highlights of the recent round goby research in Estonia. [Talk] In: Gobies as a model for invasion biology, evolutionary ecology, and reproductive strategies”. A Marcus Wallenberg symposium. , 24.-27.02.2015, Umea, Sweden . Nurkse, K. (2015) Round goby (Neogobius melanostomus). [Talk] In: 27. Marine biology winter seminar. , 04.-05.02.2015, Kivioli, Estonia . Nurske, K., Kotta, J., Orav-Kotta, H., Kotta, I., Pärnoja, M. and Ojaveer, H. (2015) Invasive epibenthic predators' impact on benthic communities functioning. [Talk] In: 10. Baltic Sea Science Congress. , 15.-19.06.2015, Riga, Latvia . Ojaveer, H. (2015) AquaNIS in action: comprehensive overview on the non-indigenous species invasions and the vectors responsible in the Baltic Sea. [Talk] In: 10. Baltic Sea Science Congress. , 15.-19.06.2015, Riga, Latvia . Ojaveer, H. (2015) BONUS projects INSPIRE and BIO-C3. [Talk] In: Conference about international cooperation. , 03.12.2015, Tallinn, Estonia . Ojaveer, H. (2015) Non-indigenous species. [Talk] In: Open lecture in Pärnu bibliotheca. , 30.03.2015, Pärnu, Estonia . Ojaveer, H. (2015) Non-indigenous species. [Talk] In: Lecture at workshop organised by Koidula Gymnasium. , 15.04.2015, Pärnu, Estonia . Ojaveer, H., Olenin, S. and Minchin, D. (2015) Proposal for IMO Ballast Water Management Convention A-4 Target Species selection criteria. [Talk] In: HELCOM Workshop on IMO BWMC target species, criteria and revision process. , 26.08.2015, Tallinn, Estonia . Ojaveer, H., Olenin, S., Minchin, D. and Boelens, R. (2015) Proposal for IMO Ballast Water Management Convention A-4 Target Species selection criteria. [Talk] In: HELCOM Workshop on IMO BWMC target species, criteria and revision process. , 26.08.2015, Tallinn, Estonia . Ojaveer, H., Teder, M., Simm, M., Raid, T. and Klais, R. (2015) Feeding eceology of pelagic fish in the Gulf of Riga. [Talk] In: ICES Workshop on Spatial Analyses for the Baltic Sea (WKSPATIAL). , 03.-06.11.2015, Rome, Italy . Petereit, C. (2015) Density columns and the principle of egg buoyancy measurements. [Talk] In: BIO-C3 Summer School. , 05.-11.07.2015, Glücksburg, Germany . Polte, P., Beyer, S., Beyer, J. and Kotterba, P. (2015) Loops of near shore habitat use by early herring (Clupea harengus) life stages in the Western Baltic Sea. [Talk] In: Herring Recruitment workshop. , 2015, Rostock, Germany . Polte, P., Kotterba, P., Heiler, J., Beyer, S., Moll, D. and Nordheim, L. v. (2015) Loops of near-shore habitat use by early herring (Clupea harengus) life stages in the Western Baltic Sea. [Talk] In: ICES Annual Science Conference 2015. , 21.-25.09.2015, Copenhagen, Denmark . Polte, P., Kotterba, P., Moll, D. and Nordheim, L. v. (2015) Drivers and stressors of Atlantic herring (Clupea harengus) recruitment in inshore Baltic Sea spawning areas. [Talk] In: 23. Biennial CERF Conference. , 08.-12.11.2015, Portland, Oregon, USA . Puntila, R., Granhag, L., Normant, M., Ojaveer, H., Strake, S. and Lehtiniemi, M. (2015) Baseline surveys of non-indigenous species in the Baltic Sea ports - Testing and evaluating the HELCOM-OSPAR Port Survey Protocol. [Talk] In: ICES Annual Science Conference 2015. , 21.-25.09.2015, Copenhagen, Denmark . Rasmussen, E. K., Uhrenholdt, T., Middelboe, A. L., Skov, H. and Hansen, F. T. (2015) Ecological model of the Riga Bay area: a contribution to the BONUS project BIO-C3. [Talk] In: 10. Baltic Sea Science Congress. , 15.-19.06.2015, Riga, Latvia . Shabeikis, A. (2015) Feeding activity and diet composition of round goby (Neogobius melanostomus, Pallas 1814) in the coastal waters of SE Baltic Sea. [Talk] In: 15. European Congress of Ichthyology. , 07.-11.09.2015, Porto, Portugal . Shabeikis, A. (2015) Feeding ecology of round goby (Neogobius melanostomus) in the coastal waters of SE Baltic Sea. [Talk] In: 1. Hjort Summer School "Fishing and physics as drivers of marine ecosystem dynamics". , 31.08.-04.09.2015, Bergen, Norway . Siaulys, A. (2015) Marine environmental protection in Lithuania. [Talk] In: National student science conference “Environmental research and protection – towards development of sustainable society”. , 2015, Gruslauke, Lithuania . Skabeikis, A. (2015) Resource competition between round goby (Neogobius melanostomus) and eelpout (Zoarces viviparus). [Talk] In: Course for PhD students "Fish and Fisheries Evolutionary Ecology". , 2015, Kristineberg, Sweden . Törnoos, A., Olsson, J., Gardmark, A., Pecuchet, L., Blomqvist, M., Lindegren, M. and Bonsdorff, E. (2015) Long-term functional trends in Baltic Sea coastal macrofauna and fish. [Talk] In: ICES Annual Science Conference 2015. , 21.-25.09.2015, Copenhagen, Denmark . Törnroos, A. and Bonsdorff, E. (2015) Interpreting ecological functioning in coastal waters: spatial and temporal trait patterns across the Baltic Sea. [Talk] In: Baltic Sea Science Congress (BSSC) 2015. , 15.-19.06.2015, Riga,Latvia . Winkler, H., Kotterba, P. and Oesterwind, D. (2015) Round Goby: A story of invasion success in the Baltic. [Talk] In: ICES Annual Science Conference 2015. , 21.-25.09.2015, Copenhagen, Denmark . Zaiko, A. (2015) Mission Impossible: measure unmeasurable and compare uncomparable. [Other] In: Seminar at the Cawthron Institute. , 2015, Nelson, New Zealand . Zaiko, A., Samuiloviene, A., Ardura, A., Garcia-Vazquez, E., Pochon, X. and Wood, S. (2015) Molecular approaches for non-indigenous species surveillance – from introduction pathways to established populations. [Talk] In: Baltic Sea Science Congress (BSSC) 2015. , 15.-19.06.2015, Riga,Latvia . Zaiko, A., Schimanski, K., Pochon, X., Hopkins, G. A., Floerl, O. and Wood, S. A. (2015) Assessing biofouling community succession using a metabarcoding approach. [Talk] In: ICES Annual Science Conference 2015. , 21.-25.09.2015, Copenhagen, Denmark . Zaiko, A., Schimanski, K., Pochon, X., Hopkins, G. A., Floerl, O. and Wood, S. A. (2015) Studies of marine biofilm communities – early succession patterns and implications for marine bioinvasions = Biofilmų tyrimai jūrinėje ekosistemoje. [Other] In: Seminar at the Klaipeda University. , 2015, Klaipeda, Lithuania . Ardura, A., Zaiko, A., Martinez, J. L., Samuiloviene, A., Semenova, A. and Garcia-Vazquez, E. (2014) eDNA and species-specific primer for early detection. A case study on the bivalve Rangia cuneata, currently spreading in Europe. [Talk] In: 1. MARES Conference : Marine Ecosystems Health and Conservation. , 17.-21.11.2014, Olhao, Portugal . Dierking, J. (2014) Unraveling ecological, genetic, and economic consequences of ecosystem regime shifts. [Talk] In: Excellence Cluster The Future Ocean Selection Symposium. , 05.05.2014, Kiel, Germany . Dierking, J. , von Dewitz, B. , Elsbernd, L., Bracamonte, S., Schulz, H., Voss, R., Hüssy, K., Froese, R. , Hinrichsen, H. H. and Reusch, T. B. H. (2014) Baltic cod genetic diversity predicted by stock structure and oxygen situation – a new indicator for ecosystem based management?. [Invited talk] In: ICES/HELCOM Working Group on Integrated Assessments of the Baltic Sea (WGIAB). , 14.10.2014, Kiel, Germany . Dierking, J. , von Dewitz, B. , Elsbernd, L., Bracamonte, S., Schulz, H., Voss, R., Hüssy, K., Petereit, C., Froese, R. , Hinrichsen, H. H. and Reusch, T. B. H. (2014) Effects of climate change on Baltic Sea fish stocks. [Talk] In: Presentation to a visiting delegation of the European Parliament Committee on Fisheries. GEOMAR Kiel. , 25.03.2014, Kiel, Germany . Dierking, J. , von Dewitz, B. , Elsbernd, L., Bracamonte, S., Schulz, H., Voss, R., Hüssy, K., Petereit, C., Froese, R. , Hinrichsen, H. H. and Reusch, T. B. H. (2014) Windows to the past: otolith records help unravel long-term changes in Baltic cod genetic composition and ecology. [Invited talk] In: Weekly seminar of the Institute for Hydrobiology and Fisheries Science (IHF). , 04.07.2014, Hamburg, Germany . Eilola, K. (2014) Impact of saltwater inflows on phosphorus cycling and eutrophication in the Baltic Sea. [Other] In: Seminar at Gothenburg University, Oceanographic department. , 14.12.2014, Gothenburg, Sweden . Jaspers, C. (2014) Will global change favor a more gelatinous marine food web? Lessons learned from the invasion history of a comb jelly in northern Europe. [Talk] In: Seminar Universität Hamburg. , 05.12.2014, Hamburg, Germany . Kotta, J., Ojaveer, H., Puntila, R. and Nurkse, K. (2014) Distribution of the invasive round goby Neogobius melanostomus in a brackish water ecosystem: relative contribution of natural and anthropogenic drivers. [Talk] In: Round goby – need for collaborative science and management in Nordic and Baltic countries. , 04.-05.09.2014, Charlottenlund Castle, Denmark . Kotterba, P. (2014) Kaviar fürs Fisch-Volk: Der Stichling ist ein unterschätzer Räuber! = Caviar to the ordinary fish people: The stickleback is an underestimated predator!. [Talk] In: 6. Rostock's Eleven Science-Communication Workshop. , 11.-13.06.2014, Rostock, Germany . Kotterba, P., Hammer, C., Polte, P. and Kühn, C. (2014) The effect of predation of threespine stickleback (Gasterosteus aculeatus) on the eggs of Atlantic herring (Clupea harengus) in a Baltic spawning site. [Talk] In: 38. Annual Larval Fish Conference. , 17.-21.08.2014, Quebec City, Quebec, Canada . Köster, F. W. (2014) Round goby – need for collaborative science and management in Nordic and Baltic countries. [Other] In: Pan-Baltic workshop co-organised by NORDEN and BIO C3. , 04.-05.09.2014, Charlottenlund Castle, Denmark . Köster, F. W. (2014) Sustainable seafood production from competitive European fisheries. [Talk] In: Research and Innovation to foster the Competitiveness of the European Agri-Food and Seafood sectors. , 10.-11.03.2014, Athens, Greece . Lesutiene, J., Skabeikis, A. and Siaulys, A. (2014) Seasonal and ontogenetic dietary changes of round goby (Neogobius melanostomus) in the exposed coastal waters of SE Baltic Sea. [Talk] In: Round goby – need for collaborative science and management in Nordic and Baltic countries. , 04.-05.09.2014, Kopenhagen, Denmark . Nurkse, K., Kotta, J., Ojaveer, H. and Orav-Kotta, H. (2014) Food consumption and dietary preference of the round goby under experimental conditions. [Talk] In: Round goby – need for collaborative science and management in Nordic and Baltic countries. , 04.-05.09.2014, Charlottenlund Castle, Denmark . Petereit, C. (2014) Wie das Schweben von Fischeiern die Verteilung bestimmt: Dorsch- und Plattfischbestände in der westlichen Ostsee. [Talk] In: Maasholmer wissenschaftliche Vorträge im NEZ (GEOMAR Vortragsreihe). , 22.07.2014, Maasholm, Germany . Petereit, C., Hinrichsen, H. H., Köster, F. W., Haslob, H., Voss, R., Kraus, G. and Clemmesen-Bockelmann, C. (2014) They are different: Methods of non-genetic population separation of Baltic Sea fish. [Talk] In: National Institute of Aquatic Resources (DTU-Aqua). , 28.08.2014, Silkeborg, Denmark . Reeh, L., Jaspers, C. , Sorensen, S. R., Christoffersen, M., Nielsen, T. G. and Munk, P. (2014) Does the 'snot' of the oceans matter? Engaging with the public on gelatinous zooplankton. Lessons learned from The Danish Eel Expedition 2014. [Talk] In: ICES Annual Science Meeting 2014. , 15.-19.09.2014, A Coruna, Spain . Reusch, T. B. H. (2014) Experimental evolution meets marine phytoplankton. [Talk] In: SMBE (Society for Molecular Biology & Evolution), satellite meeting. , 23.04.2014, Kiel, Germany . Reusch, T. B. H. (2014) Introduction to the project BIO-C3 – Causes, Consequences and Management Implications. [Talk] In: BONUS projects Kick-off meeting. , 26.-27.08.2014, Riga, Latvia . Reusch, T. B. H. (2014) Simultaneous adaptation of key phytoplankton species to ocean acidification and warming. [Invited talk] In: University of Lausanne. , 18.09.2014, Lausanne, Switzerland . Skov, H. (2014) Decadal changes in the boundaries of concentrations of marine birds – consequences for marine protected areas. [Talk] In: Littoral 2014. , 23.-26.09.2014, Klaipeda, Lithuania . Zaiko, A. (2014) BIO-C3 project presentation and work plan. [Public Lecture] In: Seminar at the Klaipeda University, Marine Science and technology Center. , 06.03.2014, Klaipeda, Lithuania . Zaiko, A., Samuiloviene, A., Ardura, A. and Garcia-Vazquez, E. (2014) Metabarcoding approach in biodiversity and biosecurity surveys: a pilot study from the Baltic Sea. [Talk] In: New Zealand Marine Science Society Conference. , 12.-15.04.2014, Nelson, New Zealand . Zaiko, A., Samuiloviene, A., Ardura, A. and Garcia-Vazquez, E. (2014) Metabarcoding approach in biodiversity surveys: a pilot study from the Baltic Sea. [Talk] In: 1. MARES Conference : Marine Ecosystems Health and Conservation. , 17.-21.11.2014, Olhao, Portugal . Moll, D., Kotterba, P., Jochum, K. P., von Nordheim, L. and Polte, P. (2017) Using elemental fingerprinting in Western Baltic juvenile herring (Clupea harengus) otoliths to distinguish different nursery areas. [Poster] In: Biology Conference of Doctoral Candidates. , 09.06.2017, Tallin, Estland . Moll, D., Kotterba, P., Jochum, K. P., von Nordheim, L. and Polte, P. (2017) Using elemental fingerprinting in Western Baltic juvenile herring (Clupea harengus) otoliths to distinguish different nursery areas. [Poster] In: ICES/PICES Symposium on Drivers of dynamics of small pelagic fish resources. , 06.-11.03.2017, Victoria, Canada . Wiegleb, J., Oesterwind, D., Kotterba, P. and von Nordheim, L. (2017) Trophic interaction of invasive round goby (Neogobius melanostomus) and Baltic herring eggs. [Poster] In: BONUS Symposium. , 17-19.10.2017, Tallin, Estland . von Nordheim, L., Kotterba, P., Moll, D. and Polte, P. (2017) Impact of spawning substrate complexity on egg survival of Atlantic herring (Clupea harengus, L.) in the Baltic Sea. [Poster] In: Biology Conference of Doctoral Candidates. , 09.06.2017, Tallin, Estland . Griniene, E. and Kuosa, H. (2016) Size-selective microzooplankton grazing on the phytoplankton in the Curonian Lagoon (SE Baltic Sea). [Poster] In: ICES Annual Science Conference 2016. , 19.-23.09.2016, Riga, Latvia . ICES Council Meeting Papers, M:497 . Kotterba, P., Moll, D., von Nordheim, L., Hammer, C., Peck, M. A., Oesterwind, D. and Polte, P. (2016) Predator impacts on inshore Baltic herring (Clupea harengus)larvae: Lions, tigers and bears – but where?. [Poster] In: European Marine Biology Symposium 2016 (EMBS 51). , 26.-30.09.2016, Rhodos, Greece . Skabeikis, A. and Lesutiene, J. (2016) Diet composition and trophic interactions between round goby and native benthophagous fish in the coastal waters of SE Baltic Sea. [Poster] In: NEOBIOTA. , 14.-16.09..2016, Vianden, Luxembourg . Arula, T., Raid, T., Simm, M. and Ojaveer, H. (2015) Factors affecting the abundance of spring spawning herring (Clupea harengus membras) larvae in the Gulf of Riga. [Poster] In: ICES Annual Science Conference 2015. , 21.-25.09.2015, Copenhagen, Denmark . Behrens, J., Flindt, E. and van Deurs, M. (2015) Round goby, physiology, salinity tolerance, invasive species, Baltic Sea. Salinity tolerance and correlated physiology of the invasive round goby Neogobius melanostomus. [Poster] In: ICES Annual Science Conference 2015. , 21.-25.09.2015, Copenhagen, Denmark . Bucholtz, R. H., Nyengaard, J. R., Andersen, J. B. and Tomkiewicz, J. (2015) Fecundity regulation, maturation progression and spawning fidelity in relation to size, condition and age of Baltic herring (Clupea harengus L.). [Poster] In: ICES Annual Science Conference 2015. , 21.-25.09.2015, Copenhagen, Denmark . Fey, D. P. and Szymanek, L. (2015) Temperature and zooplankton effects on the growth rate of larval and early-juvenile sprat (Sprattus sprattus) in the South Baltic Sea. [Poster] In: Symposium on "Growth - survival paradigm in early life stages of fish: controversy, synthesis, and multidisciplinary approach". , 09.-11.11.2015, Yokohama, Japan . Griniene, E. (2015) Abundance and composition of zooplankton communities in the continuum of the Nemunas river, Curonian Lagoon and Baltic Sea. [Poster] In: ICES Annual Science Conference 2015. , 21.-25.09.2015, Copenhagen, Denmark . Gumprich, G. (2015) Eignet sich die ICES-Datenbank zur Erfassung der Fischverbreitung und deren abiotischer Toleranzgrenzen in der Ostsee. [Poster] In: Poster-Modul 10, Thünen Institute of Baltic Sea Fisheries. , 2015, Rostock, Germany . Juodeikyte, M., Griniene, E. and Lesutiene, J. (2015) Abundance and composition of zooplankton communities in the continuum of the Nemunas river, Curonian Lagoon and Baltic Sea. [Poster] In: Baltic Sea Science Congress (BSSC) 2015. , 15.-19.06.2015, Riga,Latvia . Kotta, J., Kotta, I., Blick, A., Bastrop, R. and Välimölä, R. (2015) Description, habitat range and seasonality of a new non-indigenous polychaete Laonome sp. (Sabellida, Sabellidae) the north-eastern Baltic Sea . [Poster] In: 10. Baltic Sea Science Congress. , 15.-19.06.2015, Riga, Latvia . Margonski, P. and Calkiewicz, J. (2015) Changes in zooplankton community and its response to various environmental stressors – the case of the southern Baltic Sea. [Poster] In: 10. Baltic Sea Science Congress. , 15.-19.06.2015, Riga, Latvia . Ojaveer, H., Tomkiewicz, J., Aryual, T. and Klais, R. (2015) Female ovarian abnormalities and reproductive failure of autumn spawning herring (Clupea harengus membras) in the Baltic Sea. [Poster] In: ICES Annual Science Conference 2015. , 21.-25.09.2015, Copenhagen, Denmark . Shabeikis, A. (2015) Role of the round goby (Neogobius melanostomus) in the food web of the Baltic Sea exposed coastal waters. [Poster] In: BONUS BIO-C3/Bambi/Inspire summer school. , 05.-11.07.2015, Glückstadt, Germany . Siaulys, A. (2015) Ecological niche modelling of non-indigenous spionid Marenzelleria sp. in the Baltic Sea. [Poster] In: Baltic Sea Science Congress (BSSC) 2015. , 15.-19.06.2015, Riga,Latvia . Stupelyte, A. and Siaulys, A. (2015) Major decline of blue mussel Mytilus sp. population in coastal Lithuanian Baltic Sea. [Poster] In: Baltic Sea Science Congress (BSSC) 2015. , 15.-19.06.2015, Riga,Latvia . Arula, T., Ojaveer, H. and Simm, M. (2014) Small-scale dynamics of vital rates of herring Clupeaharengus membras and goby Pomatoschistusspp. larvae in a shallow temperate bay. [Poster] In: Final meeting of the EU FP7 [poster]. VECTORS project. , 18.-21.11.2014, La Grande Motte, France . Jaspers, C. (2014) Invasion success - looking at a key trait. [Poster] In: Future Ocean: Cluster Retreat 2014. , 29.-30.09.2014, Schleswig, Germany . Jaspers, C. , Antajan, E., Asmus, R., Boersma, M., Binetti, U., Bonnet, D., Christensen, J. T., Delpy, F., Finenko, G., Fuentes, V., Haraldsson, M., Haslob, H., Hosia, A., Huwer, B., Javidpour, J. , Kamburska, L., Kellnreitner, F., Kube, S., Langenberg, V., Lesniowski, T., Lilley, M., Lombard, F., Malzahn, A., Marambio, M., Mihneva, V., Moeller, L. F., Niermann, U., Okyar, M. I., Pitois, S., Riisgaard, H. U., Robbens, J., Schaber, M., Stefanova, K., Thibault, D., van der Veer, H., Vansteenbrugge, L. and van Walraven, L. (2014) A synthesis of the distribution of Mnemiopsis leidyi in European waters. [Poster] In: ICES Annual Science Meeting 2014. , 15.-19.09.2014, A Coruna, Spain . Zaiko, A., Samuiloviene, A., Ardura, A., Borrell, Y. and Garcia-Vazquez, E. (2014) New Generation molecular techniques in the Baltic Sea research or every sea drop has its own "barcode". [Poster] In: Marine science and technology 2014. , 23.-25.04.2014, Klaipeda, Lithuania . Örey, S. (2018) Thinner females - fewer eggs? Temporal trends in Eastern Baltic cod fecundity (2005-2016). (Master thesis), Christian-Albrechts-Universität Kiel, Kiel, Germany, 59 pp. Rodriguez Buelna, A. S. (2016) Inter‐annual variation in abundance of three species of jellyfish in the Bornholm Basin. (Master thesis), DTU ‐ Technical University of Denmark, Lyngby, Denmark, 60 pp. Urban, P. (2016) Unlocking the potential of biological sample archives: benthic-pelagic feeding of Baltic cod assessed by otolith protein amino-acid specific stable isotope analysis. (Bachelor thesis), Christian-Albrechts-Universität Kiel, Kiel, Germany, 46 pp. Bock, C. (2015) Seasonal habitat utilization and feeding ecology of round goby (Neogobius melanostomus) within the Pomeranian Bight. (Master thesis), Universität Rostock, Rostock, Germany, n/a pp. Gabel, M. (2015) Rolle der Schwarzmundgrundel (Neogobius melanostomus) in der Ernährung des Kormorans (Phalacrocorax carbo sinensis) an der Vorpommerschen Küste. (Master thesis), Universität Rostock, Rostock, Germany, n/a pp. Henseler, C. (2015) Habitat specific feeding ecology of the round goby (Neogobius melanostomus) in the Greifswald Bay. (Master thesis), Universität Rostock, Rostock, Germany, n/a pp. Kotterba, P. (2015) Atlantic herring (Clupea harengus) within the estuarine food web of a southern Baltic Sea lagoon. (Doctoral thesis/PhD), Universität Hamburg, Hamburg, Germany, 180 pp. 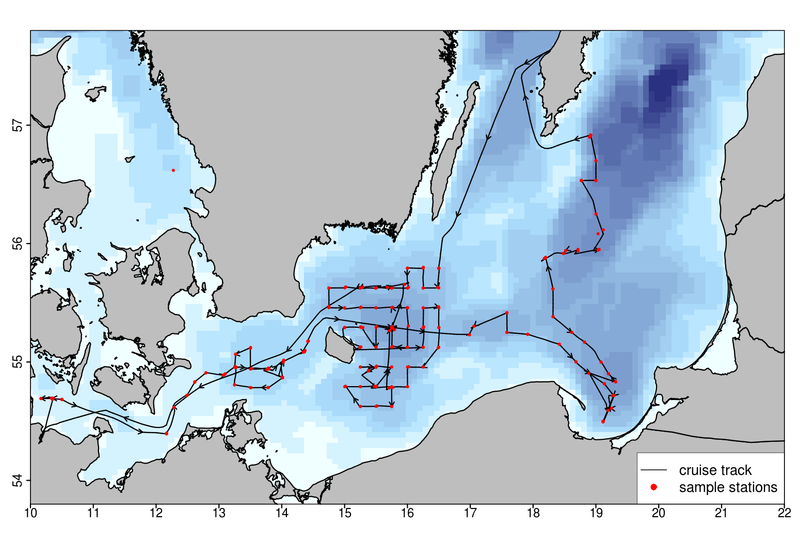 Siebert, V. (2015) The Spatial and Temporal Distribution of Cod (Gadus morhua), Herring (Clupea harengus) and Sprat (Sprattus sprattus) in the Bornholm Basin as resolved by hydroacoustics. (Master thesis), Universität Rostock, Rostock, Germany, n/a pp. Mohm, C. (2014) Feeding ecology of Baltic cod assessed by stable isotope analysis. (Bachelor thesis), Christian-Albrechts-Universität Kiel, Kiel, Germany, 42 pp. Webers, F. (2014) Occurrence of fish larvae in the Kiel Canal and the Kiel Fjord in relation to water temperature. (Bachelor thesis), Christian-Albrechts-Universität Kiel, Kiel, Germany, 42 pp. Dierking, J. , Jaspers, C. and Heinemann, P. (2017) Filets aus Daten. Welt am Sonntag , 21.05.2017 , 21. Oesterwind, D. (2016) Schwarzmundgrundel. ZEIT , 07.10.2016 . Reusch, T. B. H. and Jaspers, C. (2015) Schwarzmundgrundel und Meerwalnuss: Neubürger in Nord- und Ostsee: Die Globalisierung macht vor der Meeresumwelt nicht halt: Auf lange Sicht wird die Artenvielfalt darunter leiden. shz.de , 12.5.2015. Bonsdorff, E. (2015) Monthly column on topics regarding marine and environmental policy making in the light of science. Abo Underrättelser . Nestler, R., Behrens, J. and Jaspers, C. (2014) Das Meer von morgen. Der Tagesspiegel , 21.06.2014 , 22080. Puntila, R. (2014) Non-indigenous species in Gulf of Bothnia. Raahen Seutu , 14.10.2014 . Puntila, R. (2014) Where to report on observations of non-indigenous species. Raahen Seutu , 17.10.2014 . Dierking, J. (2018) Cruise Summary Report AL507: 15.04-29.04.2018. . , 4 pp. Dierking, J. (2017) Cruise Report ALKOR AL491. . , 10 pp. DOI 10.3289/CR_AL491. Dierking, J. (2017) Cruise Summary Report ALKOR AL491. . .
Herrmann, J. P. (2017) Cruise Report ALKOR AL497. . , 11 pp. DOI 10.3289/CR_AL497. Jaspers, C. (2017) Cruise Report R.V. Alkor Cruise No. : AL499. . GEOMAR, Kiel, Germany, 17 pp. DOI 10.3289/CR_AL499. von Dewitz, B. (2017) Cruise ReportR.V. ALKOR, Cruise No. : AL 493. . , 20 pp. DOI 10.3289/CR_AL493. von Dewitz, B. and Wagner, C. (2016) Cruise Report R.V. Alkor Cruise No. : AL478. . GEOMAR Helmholtz-Zentrum für Ozeanforschung, Kiel, Germany, 13 pp. DOI 10.3289/CR_AL478. Dierking, J. (2016) Cruise Summery report: ALKOR AL476 vom 13.04. - 28.04.2016. . , 4 pp. Dierking, J. (2015) Cruise Report R.V. Alkor, Cruise No. : AL454. . GEOMAR, Kiel, Germany, 13 pp. Dierking, J. (2015) FS ALKOR Cruise Summary Report AL454. . , 4 pp. Oberbeckmann, S. (2015) Cruise Report RV "POSEIDON" Cruise-No. POS488. . IOW Leibniz Institute for Baltic Sea Research, Rostock- Warnemünde, 11 pp. DOI 10.3289/CR_POS_488. von Dewitz, B. (2015) FS ALKOR Cruise Report AL457. . GEOMAR, Kiel, Germany, 4 pp. DOI 10.3289/CR_AL457. von Dewitz, B. (2015) FS ALKOR Cruise Summary Report AL457. . , 4 pp. von Dewitz, B. (2014) Cruise Report RV ALKOR AL 437 [AL437]. . GEOMAR, Kiel, Germany, 12 pp. DOI 10.3289/CR_AL437. Dierking, J. and Shipboard Scientific Party (2014) RV ALKOR Fahrtbericht / Cruise Report AL435 14.04.-29.04.20143 Kiel - Kiel. . GEOMAR Helmholtz-Zentrum für Ozeanforschung, Kiel, Germany, 14 pp. DOI 10.3289/CR_AL435. Haslob, H. (2013) Cruise Report R.V. Alkor AL 415. . GEOMAR, Kiel, Germany, 20 pp. DOI 10.3289/CR_AL415. This list was generated on Sun Apr 21 19:48:11 2019 CEST.